If you manage a service based business today, it is vitally important to understand how your company is being talked about across the Internet. Gone are the days where people called or wrote to you with a customer complaint. In today’s age of social media, customers are more and more frequently choosing to post their thoughts and comments online. 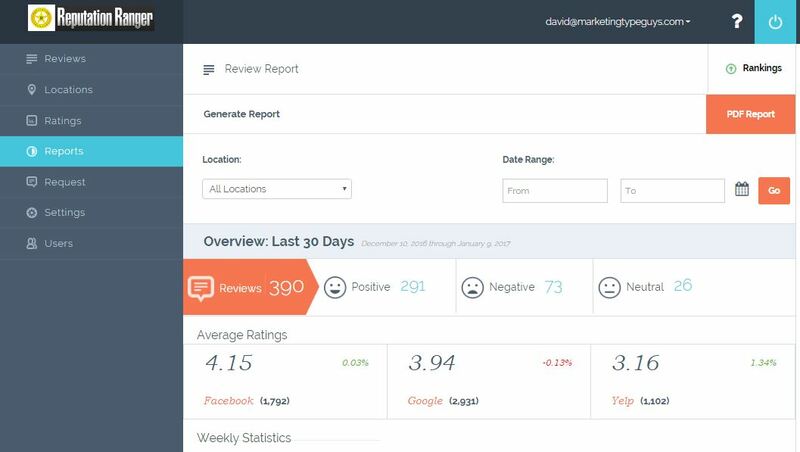 Whether your business has 1 location or 500, our custom dashboard make it easy to manage your online reviews. Compare how your locations rank against each other with our custom ranking system. Providing the most thorough and accurate review monitoring solution in the industry, Reputation Ranger is also extremely affordable. Pricing starts at only $29/month! >> To learn more, visit ReputationRanger.com or contact us.